The end area (currently closed) sees most of the larger sharks and rays, most commonly bat rays or shovelnose sharks. Occasionally larger sharks such as soupfins or threshers will show up but they’re usually youngsters (a 70-pound thresher was caught in March of ’00) and when they do they will generate considerable interest. Of interest too was a small 3-foot-long hammerhead shark landed one day in August 2005 by a startled and probably somewhat confused angler; another hammerhead was landed in July of 2015. 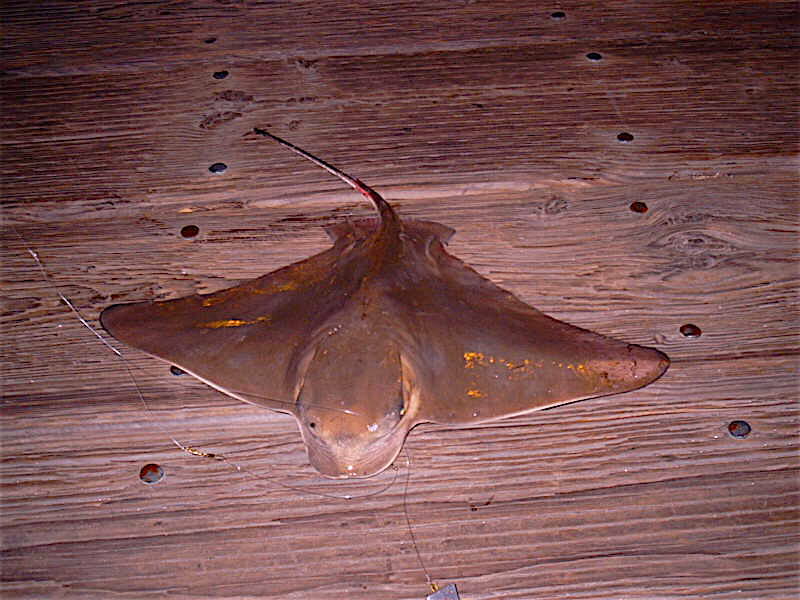 Two members of the family Rajidae have been reported to PFIC, a big skate (Raja binoculata) in 2001 and a California skate (Raja inornata) in January of ’08. The end area (still closed) also seems to be the spot where most of the pier’s cabezon have been caught (and quite a few of the “king” of the sculpin have been reported during the past few years). Since cabezon are more commonly taken from southland rocks and jetties their appearance is somewhat surprising; most likely it is due to the nearby artificial reef. You may occasionally see long, slender fish cruising near the surface of the water. First impressions are that they are barracuda but usually they turn out to be needlefish that have ventured out from the waters of Alamitos Bay and Anaheim Bay. You can try for these with a bobber and a live fish like smelt, but they are hard to hook. Unusual fish have included a 20-pound striped bass in April of 1998; another striper, although smaller, was taken a month later. In January of 2009 a cusk-eel was taken from the pier. El Niño, warm-water years (like 1959) will often see more exotic species landed. A Pacific bumber (Chloroscombrus orqueta), once called Pacific yellowtail jack, was caught September 13, 1959 from the pier while a Pacific threadfin (Polydactylus approximans) was recorded from Seal Beach on March 3, 1959. In November of 2009 two juvenile Mexican lookdowns (Selene brevoortii) were taken from the beach by net. The fish, commonly found from the southern tip of Baja down to Panama, had been recorded as far north as San Diego during the 1997-98 El Niño but never north of that area. One fish you may spot that is actually common, although rarely caught, is striped mullet. Since the fall of 1999 PFIC has received several reports of large schools of mullet hanging around the inner sections of the pier. Apparently some of the schools contained hundreds of 2-3-foot-long fish. Break out the dough balls, light line, and tiny hooks if you want to try to catch them (although they’re more commonly snagged). Fishing Tips. As mentioned, there are two distinct fisheries at the pier. From the mid-pier area to the end (actually the mid-pier area until the end is opened), use two rods. For the smaller fish, especially queenfish, use light tackle and a multi-hook Lucky Lura or Sabiki-type leader with size 6-8 hooks. Drop the leader to the bottom and simply lift up and down; this works better than a jerky motion. If you are not getting any fish, try your leader at different depths. If schools of queenfish are present, they shouldn’t be too hard to catch. I say present because the queenfish typically move into these waters by the first of June and stay resident throughout the rest of the summer and fall. During the winter they head out to deeper water and tend to be replaced by schools of walleye surfperch. If the queenfish are absent, size 8-12 multi-hook riggings will take a variety of other small fish—topsmelt, jacksmelt, salema, and an occasional Pacific butterfish (pompano). Sometimes these species like the hooks sweetened with a small piece of worm, strip of mussel, or small piece of shrimp. 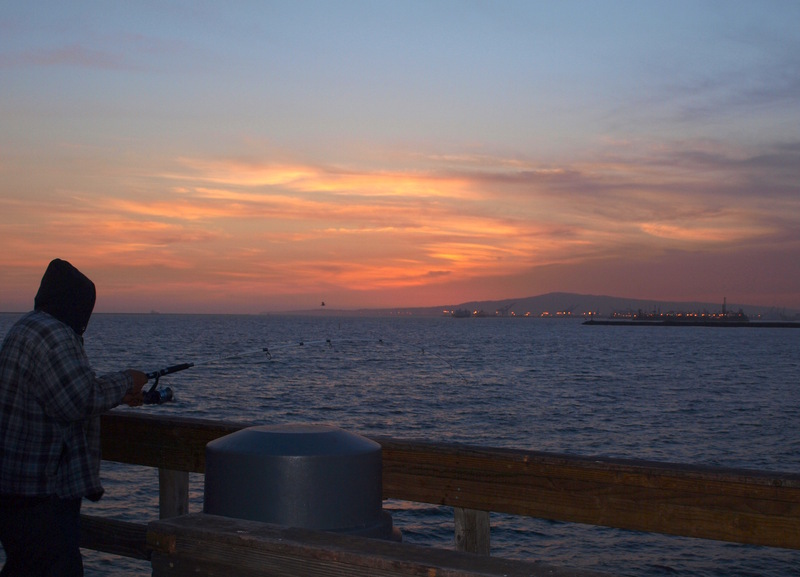 If present, mid-pier to the end can see schools of sardines by the pier. The sardines are prime live and dead bait and luckily are pretty easy to catch with the small hook size (8-12) bait rigs. Use a slightly heavier rod for halibut and use live anchovies, sardines or small queenfish rigged on a fish finder leader as your bait. Although halibut may be caught almost anywhere from the pier, I like to try the depressions between the pilings; these areas often harbor good numbers of the flatties. Cut anchovy on the bottom will yield some white croaker, sand bass, kelp bass, sharks and rays. As mentioned, the end area (when open and hopefully someday it will reopen) ) is usually the prime area for those seeking the bigger sharks and rays. If specifically seeking out the large threshers and bat rays, come prepared with a heavier rod and reel, 40-60 pound test line and a 6/0 to 7/0 hook. Try a trolley rig with a live mackerel or sardine for the threshers, use cut squid or a bloody piece of mackerel on the bottom for the rays. Many a large thresher is hooked from the pier but few are landed. Many mid-sized bat rays are landed but most of the bigger beasts are lost. And, the bat rays do reach gargantuan size. In March of ’01 there was an influx of the big mud marlins that coincided with the invasion of local beaches by grunion. A 140- and then 160-pound fish were caught and weighed. 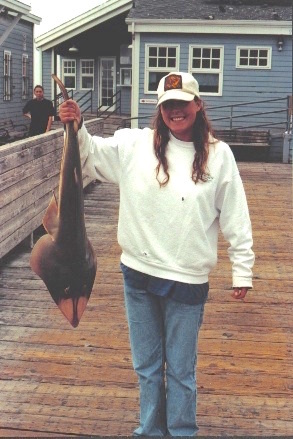 Then the really BIG fish was landed, an estimated 200+ pound bat ray that dwarfed the earlier fish and required five guys to lift up to the pier for pictures. Soon after, the happy angler announced that he wanted to release the prize and the party of five had to once again lift up the heavy beast before lowering it down to the water. Just hope it survived the ordeal (but I doubt it). Another big bat ray, estimated to weigh 170 pounds was landed in May of ‘’001. Several anglers who specialize in sharks and rays feel that Seal Beach offers the best chance to get the really big, 100+ pound mud marlins, and they may be right. 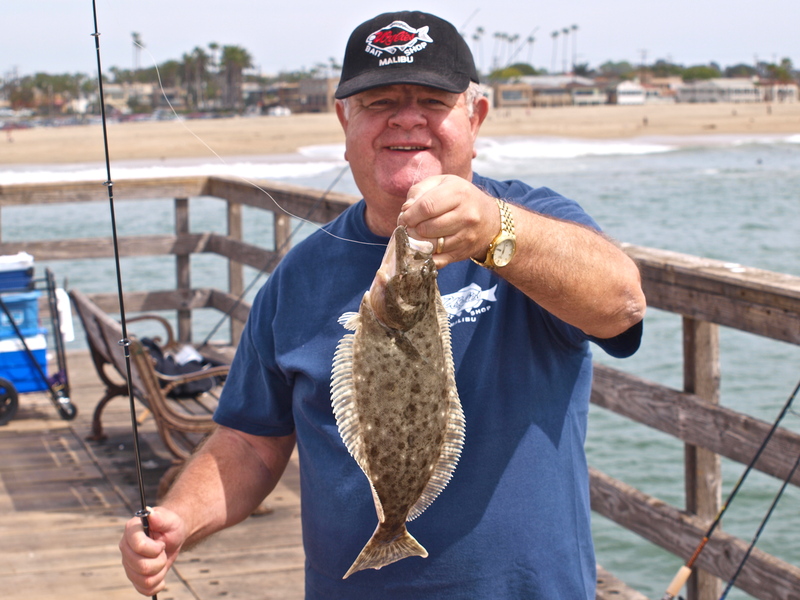 Just to demonstrate the power of the grunion gods, halibut also began to hit fast and furious during the grunions’ visit to the inshore waters around the pier. Many, many flatties were caught including several keepers every day. 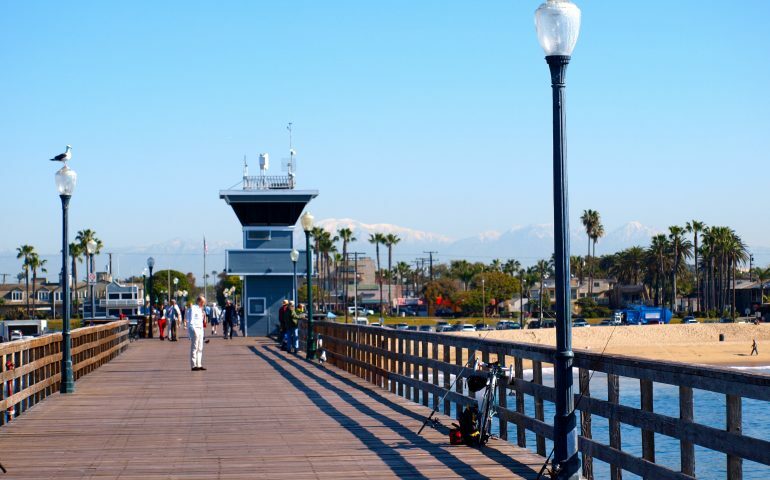 Although most of the hallies were caught on fresh or frozen bait (including grunion), PFIC reporter Dillon decided to cast out a lure—a Wham Lure (that looks like an anchovy) from the side of the pier. His result—a keeper, 26-inch fish. Local expert George Van Zant reports that the bottom slopes rather rapidly on the eastern side of the pier reaching a depth near 20 feet by the end. He also says that there is a shale-like bottom area out from the pier that is home to many a large halibut. 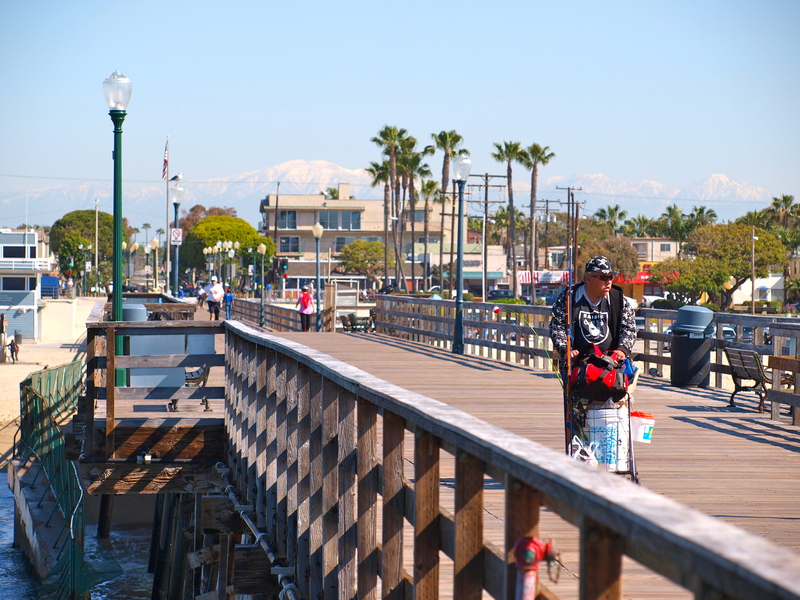 Though great for boaters it’s supposed to be just outside of normal casting range for most pier anglers. If adventurous, you might try a trolley rig in the area, casting out your sinker and then sliding live bait down the line. You would probably need an eastern flowing current for this to work with the hallies but it might be worth a try. As for myself, I’ve always had pretty good luck fishin’ the depressions between the pilings. Another regular, Bobbie Lienau, reported local anglers “walking” their baits for big halibut. They will use fresh anchovies, smelt, grunion or small queenfish as bait and bury a fairly good size hook in their head. They cast straight out using as light a weight as possible and then slowly walk the bait down the pier. The key is a fairly empty pier (since you’re using up quite a bit of area). Quite a few halibut in the 13-18 pound range have been landed using this technique. Another key according to Mr. Lienau is to use fairly light line; I would recommend using fluorocarbon to fool the hallies. A final note on halibut is the use of lures by some of the locals. A variety of lures have proven effective including Big Hammer swim baits and Berkley Gulp! Jerk Shad (in the sapphire shine color). One area I used to like to fish is just past and to the left of where the closure gates are now located. There once was a bait and tackle shop there where you could buy bait, tackle and tickets for the pier’s Sportfishing boats. One day the Sportfishing Landing moved but the shop still stood empty for several years. I had some tremendous luck on buttermouth (black perch) there as well as good action on the big pileperch, the fish that often like to drive people a little crazy. The pileperch will swim languidly around the pilings as well as back and forth from piling to piling all the while in water shallow enough to be seen by anglers up above. Seeing them and getting them to bite are two different things. The piles are epicurean and want something similar to what they see on the mussel-encrusted pilings that they are checking out. Fresh mussels and small sidewinder crabs are the answer for bait while light tackle is helpful in attracting the line-shy perch. I would usually use 6-8 pound fluorocarbon line, a size 8 hook, and just a small twist-on sinker for weight. Drifting the offerings right up against the piling and being prepared for a quick, hardly-detectable bite was the technique. 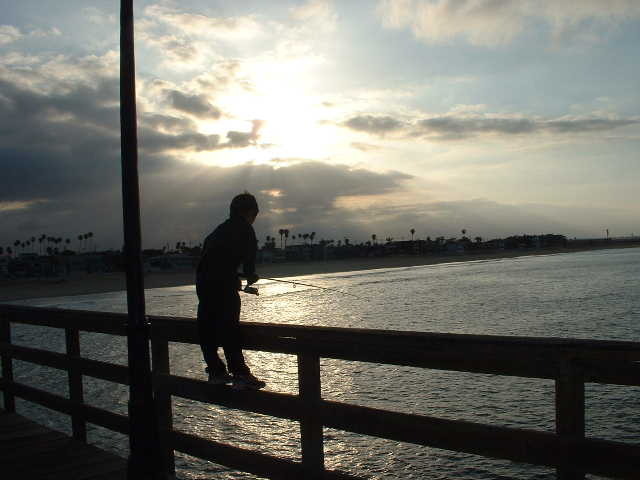 Then I would hang on as the fish would try to wrap the line around the pilings. A successful operation could yield perch in the 14-16 inch range and if I was lucky, once in a while a large rubberlip seaperch would grab a bait.